A few Augusts ago, my friends Jeni and Ben and their three kids came to visit us. They live on the Upper West Side, which is only about a 20-minute drive from my house, and yet, with full-time jobs and full-time families (their oldest daughter was about 4 which would make her twins 2, and my kids were 6 and 4), we had the hardest time coordinating get-togethers. (You know that famous New Yorker cartoon, “How about never — does never work for you?” That was us.) Well, on this particular occasion, we had by some miracle figured out a time that worked for a drive-by. It was a Saturday — couldn’t do lunch (soccer practice, naps) couldn’t do dinner (twins’ bedtime looming) so we settled on the somewhat odd, not-quite-cocktail-hour of 5:00. “Just stay for dinner,” I told her when she called that morning. I agreed begrudgingly. But then I hit the farmer’s market where, of course I was bamboozled by my daughters into buying a container of BuddhaPesto. The stuff is so good. I mean, so so good and leprechaun green and fresh you just can’t believe it. (The Times‘ Jeff Gordinier was similarly smitten last summer.) And, since it was August, there were tomatoes. The kind of tomatoes you dream of all year long. Striped, heirloom, green, gold, cherry, plum, little, big, blistered, exploding. The kind of tomatoes you slice at dinnertime, drizzle with a little olive oil and sprinkle with sea salt, and then back away from. Because to do anything more, to add anything else, would be to incur the wrath of the tomato gods…or me, for that matter. You know the Virginia Lee Burton book The Little House about the cottage that stands peacefully still as construction and skyscrapers and general chaos looms all around. That’s how I picture Jeni and Ben eating that dinner. I will never forget how grateful two people could look eating the world’s simplest summer meal, as five screeching kids launched into their fifteenth game of Elefun in the living room. Jeni tried to fight it, but was powerless in the face of the tomatoes. “I told you not to do anything,” she attempted weakly. I guess. But, I reminded her, it doesn’t take much. Cook spaghetti according to package directions. Drain, reserving 1/4 cup of pasta water. Toss pasta with a little olive oil while it sits in the colander. Add prepared pesto (the freshest you can find, such as BuddhaPesto) to the same pot you boiled spaghetti in and whisk in a drizzle of pasta water until it’s saucy, but not watery. Add pasta back to the pot and toss. Serve garnished with freshly grated Parmesan. While spaghetti cooks, slice summer tomatoes onto a plate. Drizzle with a tablespoon or so of the best olive oil you’ve got, sprinkle with sea salt (and pepper, if you must) and serve alongside pasta. This looks delish! And so simple. My SO and I work full time and we have a toddler so this is a perfect week night meal. Thank you! Pesto pasta was my favorite as a child and still hits the spot every time! Plus that is the best summer pasta! A good reminder that dinner with friends needn’t be complicated. AND I read your newsletter, do I win the Franny’s cookbook? Possibly the best summer meal ever. Came home from vacation to nothing in the fridge, but was still able to scrounge basil and tomatoes out of my tiny garden plot and plop this meal on the table in 20 minutes. Spaghetti with pesto and a salad of sliced tomatoes w/only some olive oil, salt and pepper and maybe, vinegar to dress. Sounds like the perfect simple summer supper. I love the muffin tin idea! “I read your newsletter, do I win the Franny’s cookbook? Love your posts, thank you for the inspiration! Funny, pesto pasta is on the menu for tomorrow, need to use up the crop of basil from the garden. I have read great things out it!! This is a summer staple in our house! I read your newsletter. Do I win the Franny’s cookbook? “I read your newsletter, do I win the Franny’s cookbook?” Hey, thanks for this great giveaway! “I read your newsletter, (and I love your blog!) do I win the Franny’s cookbook?” Please? Looks delicious. Love pesto, especially in the summer when the basil is running wild. Mmmmmm . . . pesto. Loved by all in our family. Sigh… I wish it could be tomato season here soon! I read your newsletter, do I win the Franny’s cookbook? Sometimes the best meals are the simplest. I read your newsletter do I win the Franny’s cookbook? Love your blog! I read your newsletter, do I win the Franny’s cookbook? 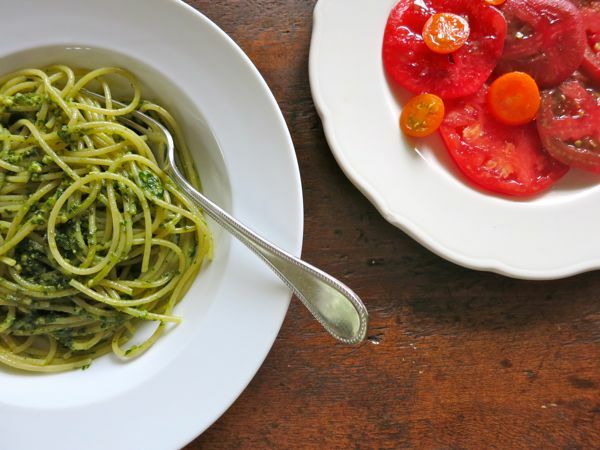 Pesto & tomatoes from our garden are a favorite summer dinner at our house. It is practically doing nothing! The best–and maybe, just maybe the only–good thing about moving from sunny Southern California to the cool verdant clime of upstate New York are the tomatoes. California tomatoes just never had that special East coast taste–is that enough to say farewell to perpetual sunshine and those magnificent beaches? Yes–at least now, in August. This looks fabulous! I will have to try it! Our tomatoes have only just started coming in. A short and – hoping for – sweet summer. I read your newsletter, do I win the Franny’s cookbook? ive been eating tomato sandwiches on a daily basis and still cant get enough! I can make this entire meal from my GARDEN! Yay! *sigh* Pesto. Few things make me feel more content in the kitchen than whipping up a batch of pesto with the basil from my garden. BTW — I read your newsletter, do I win the Franny’s cookbook? We have been making lots of pesto lately — an excellent way to use up greens: arugula, kale, parsley. And so fresh and green, yum! Great addition for sandwiches too. If only we got tomatoes like you describe…wrong climate in NE Minnesota. Thanks for inspiration and reminder how much parents appreciate a meal like this!! Funny how meals like these can end up being the ones you remember and keep talking about years later. also: I read your newsletter, do I win the Franny’s cookbook? How much do i love Franny’s food…almost as much as your recipes! Such a perfect dinner. Yum. I read your newsletter too… Do I win the Franny’s cookbook? Okay, BIG pet peeve of mine is for friends to come by near dinner time, but insist that we not go out of our way to feed them! Um…hello, it is going out of our way not to eat at dinner time!…not a problem to throw a little extra food in the pot and serve everyone! And oh how I love sliced heirloom tomatoes with a little salt and pepper! Lovely summer dinner! Those tomatoes could not be more beautiful. I made your past tonight with a local Portland, OR pesto with arugula and hazelnuts and tomatoes from the garden!! Yummy, a perfect Summer meal. I do read your newsletter, do I win the Franny’s cookbook ? We don’t have a Franny’s in Oregon!! Delicious indeed. You are a good friend to have! One of the best flavor combinations ever! I fall back on it regularly and always end up loving those fresh, flavorful meals. I read your newsletter (and use a well-stained copy of the DALS book more often than any other), but I’m not eligible to win the Franny’s cookbook. I meant to say, too…thanks for the recipe and story above. I did pesto + pasta + tomatoes last week and there was a little something missing…and now I know what it was: pasta water. This makes me smile. I read your newsletter, do I win the Franny’s cookbook? Pesto is one of our summer staples, and one of the few things both my boys will eat. Love this pasta dish. We make a variation on it regularly! p.s. My mom LOVED her DALS Mother’s Day gift. (With personalized bookplate!) Thank you! I read your newsletter. Do I win the Franny’s cookbook? Looks deelish! I read your newsletter, do I win the Franny’s cookbook? feeding the kiddos is always easier to do at home but it is good to expose them to new meals, new people and new places when they eat. its nice to hear that other people go through this dilema. That’s what I love about summer dinners – they make themselves! I read your newsletter. Do I win Franny’s cookbook? also, this does look yum. You are so good to your friends. I read your newsletter,do I win the Franny’s cookbook? Delicious meal – but I disagree with the commenter about regarding people visiting at meal times. This awkward hour was the only time to catch up and they’d specifically requested not to be fed – in my opinion, it’s rude to hand over a full meal. They may have had other plans, or like eating later, or wanted to use up food they had at home and despite politely declining a meal were forced into one. A delicious meal, but in my opinion some small inconsequential bites would have been a more hospitable way to treat guests. The picture of the pasta and tomatoes is beautiful. The best part of summer is being able to “cook” dinners like this. “I read your newsletter, do I win the Franny’s cookbook?” BTW, this meal looks awesome! Pesto pasta and tomato dinner…double winner! I read your newsletter, do I win the Franny’s cookbook? Yum. I live for summer tomatoes. 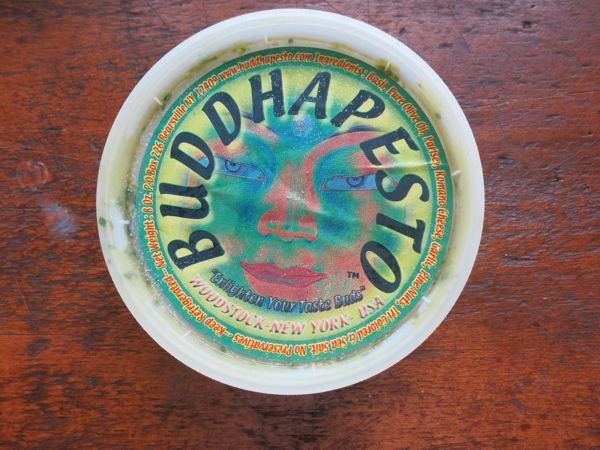 Buddha Pesto Rocks! So happy to have it at our farmer’s market year round!